Wanna dig into some hearty, zesty, comfort-food goodness? One bowl of THIS stew, comin' right up! Season chicken with cumin, chili powder, garlic powder, and onion powder. Place chicken in a slow cooker. Add all remaining ingredients except broth, sour cream, cheese, and cilantro. Top with broth, and stir well. Cover and cook on high for 3 - 4 hours or on low for 7 - 8 hours, until chicken is fully cooked. Transfer chicken to a large bowl. Shred with two forks -- one to hold the chicken in place and the other to scrape across and shred it. 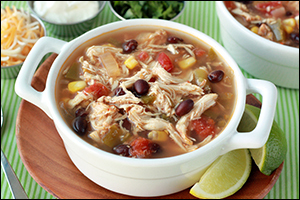 Return shredded chicken to the slow cooker, and stir well. Top each serving with 1 tbsp. each sour cream, cheese, and cilantro. Enjoy! Place chicken in a slow cooker. 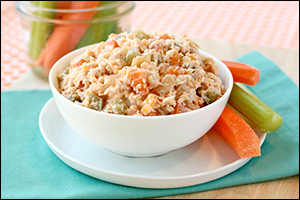 Top with celery, carrots, onion, and garlic. Add 1/4 cup water. In a medium bowl, stir cheese wedges until smooth. Add hot sauce, yogurt, and Parm-style topping. Mix well. Add to the slow cooker, and stir to coat. Serve and enjoy! Chicken and slow cookers go together like "Send to" and "a Friend." Click "Send to a Friend" now! On January 30th, 2007, we debuted our Jalapeño Swappers recipe. Might wanna break out this gem for Super Bowl Sunday!